Wexford defeated Waterford by 1-9 to 0-10 in Round 3 of the Allianz Football League Division 4 on Sunday February 26th at Innovate Wexford Park. Kevin O’Grady’s 25th-minute goal proved decisive as it helped Wexford to a two-point victory in this top-of the table clash at Innovate Wexford Park. It was Wexford’s ability to control possession while playing into the strong wind and rain in the first 35 minutes that laid the foundations for the win. Four unanswered points from Donie Breathnach, Paul Whyte, Michael O’Halloran and Patrick Hurney’s free put Waterford in front, but Ciaran Lyng hit back with a free and O’Grady’s goal sent the teams in level, 1-3 to 0-6, at the interval. The sides continued to trade points, but a late Patrick Hurney point came too late to help Waterford salvage the game. Scorers – Wexford: K O’Grady 1-2; C Lyng 0-3 (2f); B Brosnan 0-2 (1f); J Tubritt, M O’Regan 0-1 each. Waterford: P Hurney 0-4 (3f); D Brethnach 0-2, P Whyte 0-2 (1f); M O’Halloran, C Murray 0-1 each. Subs: M O’Regan 7 for Stafford (41); C Carty 7 for Curtis (52); J Firman 6 for Tubritt (63); R Devereux for O’Grady (72). Subs: L Lawlor 6 for Veale (57); F O Cuirrin 6 for Dalton (60). Ref – F Smyth (Offaly). This entry was posted on Sunday, February 26th, 2017 at 12:00 am and is filed under events, News. You can follow any responses to this entry through the RSS 2.0 feed. Both comments and pings are currently closed. Cork defeated Fermanagh by 1-14 to 0-9 in Round 3 of the Allianz Football League Division 2 on Sunday February 26th at Pairc Ui Rinn. A comfortable win for Cork in a surprisingly sunny Pairc Ui Rinn, the Rebels too strong for visitors Fermanagh in this NFL Division 2 clash. Cork defended the scoreboard end in the first half and Fermanagh appeared to have the backing of the breeze. The home side were sharper early on, with captain Paul Kerrigan effective up front, hitting two early points. Fermanagh’s patient build-up play broke down more than once in the face of Cork pressure, and by the end of the first quarter they had one point, from Tomas Corrigan, to show against Cork’s four. Wayward shooting didn’t help the visitors, who hit five wides in that time, but Sean Quigley pointed a free for their second on 20 minutes and added a 45 a minute later. Cork hit back with a sweet Donncha O’Connor point, and O’Connor and Kerrigan then combined to set up Niall Coakley for a goal from close range: 1-5 to 0-3 on 24 minutes. Coakley added a free and Kerrigan a point from play before half-time, but Fermanagh’s Eddie Courtney hit one more for the men in green before the break: 1-7 to 0-4 at the half. Brian O’Driscoll pointed for Cork on the resumption but two Quigley points gave Fermanagh a boost. Coakley (free) and Connolly made it a seven-point game before Kerrigan almost got Cork’s second goal, only for Tomas Treacy to save well. Turning into the third quarter Cork were well in control, and though Fermanagh tried hard they couldn’t convert their industry into scores, and Cork had 8 to spare at the end, Treacy denying Kerrigan a second goal at the death. Scorers for Cork: N. Coakley (4 frees)(1-4); P. Kerrigan (0-4); B. O’Driscoll (0-2); J. O’Rourke, D. O’Connor, L. Connolly, D. Og Hodnett (0-1 each). Scorers for Fermanagh: S. Quigley (4 frees, 1 45)(0-5); T. Corrigan, E. Courtney, A. Breen, R. Jones (0-1 each). Cork: K. O’Halloran, K. Crowley, T. Clancy (Clonakilty), M. Shields, T. Clancy (Fermoy), J. Loughrey, S. Cronin, A. Walsh, R. Deane, B. O’Driscoll, L. Connolly, J. O’Rourke, N. Coakley, D. O’Connor, P. Kerrigan. Subs: C. O’Neill for O’Connor (53); M. Collins for O’Rourke (55); C. O’Driscoll for Crowley (60); D. Og Hodnett for Connolly (62); P. Kelleher for Coakley (66); K. O’Driscoll for B. O’Driscoll (70). Subs: R. Jones and K. Connor for Lyons and P. McCusker (HT); J. McMahon for McCluskey (53); D. Keenan for Corrigan (57); P. Reihill for D. McCusker (60). CORK: Ryan Price; John McLoughlin, Tom Clancy, Kevin Crowley; Tomas Clancy, James Loughrey, Stephen Cronin; Aidan Walsh, Ruairi Deane; Brian O’Driscoll, Luke Connolly, John O’Rourke; Niall Coakley, Peter Kelleher, Paul Kerrigan. Galway defeated Clare by 3-13 to 1-11 in Round 3 of the Allianz Football League Division 2 on Sunday February 26th at 2pm in Pearse Stadium Salthill. Galway’s quietly effective start to the Allianz League continued at Pearse Stadium with Kevin Walsh’s improving team eking out another solid and satisfactory win. Dominant for vast chunks of the first half, Galway, missing the injured Damien Comer, absorbed a gutsy Clare effort in the third quarter before confidently closing out the deal. Clare, without talisman Gary Brennan, struggled to deal with the locals, who struck two fine first half goals from Eamonn Brannigan and Shane Walsh. After the restart Keelan Sexton did rattle the Galway net, but Gareth Bradshaw, highly effective throughout for the home team, responded with a third Tribe major. With Paul Conroy splendid at centrefield Galway’s pacy attack caused Clare plenty of problems early on as the promising Michael Daly impressed. Brannigan burst through for a delightful sixth minute goal, while Walsh added a second on the half hour mark. At the interval Galway led by 2-8 to 0-5, while points from Johnny Heaney and Barry McHugh extended Galway’s advantage further when the action recommenced. An Eoin Cleary free was followed by a 44th minute Sexton goal and Clare eventually narrowed the gap down to six. But 13 minutes from the end Bradshaw reacted quickly when Joe Hayes saved from Heaney to bundle the loose ball over the line for the insurance goal. There was plenty to admire in this enterprising display from Galway, who have registered two wins and a draw from three matches. That will encourage Walsh ahead of next Sunday’s important trip to Navan for a clash with Meath. Scorers for Galway: Barry McHugh 0-5 (4fs), Gareth Bradshaw 1-2, Shane Walsh 1-1, Eamonn Brannigan 1-0, Gary O’Donnell, Johnny Heaney, Micheal Lundy, Michael Daly, and Paul Conroy 0-1 each. Scorers for Clare: Eoin Cleary 0-4 (3fs), Keelan Sexton 1-0, Jamie Malone 0-3, David Tubridy 0-2 (1f), Liam Markham and Ciaran Russell 0-1 each. Monaghan defeated Kerry by 2-8 to 1-10 in Round 3 of the Allianz Football League Division 1 on Sunday February 26th at Fitzgerald Stadium Killarney. Monaghan’s impressive start to the Allianz League continued with a deserved and important win over Kerry that keeps the Farney men unbeaten after three rounds. Malachy O’Rourke’s team are well positioned with five points from a possible six ahead of a tough trip to Tyrone next Saturday. For Kerry this was a second home defeat on the trot, and if the Kingdom are to harbour real hopes of getting back to the League final they will need to find some victories and points fast, starting with a win next weekend away to Roscommon. Only two points from play – none in the second half – is the sort of statistic to annoy Eamonn Fitzmaurice more than worry him at this stage of the year, but Kerry will need to find some way of rebooting their season quickly. Monaghan won’t view this performance as anything other than ordinary either, but O’Rourke has plenty to be pleased about on the back of this win. Goals in either half from Jack McCarron and Gavin Doogan laid the platform for Monaghan’s win, with Doogan’s 39th minute goal wrestling the lead off Kerry, and the Kingdom couldn’t recover. That score made it 2-3 to 1-6, after Kerry had edged three points clear courtesy of a James O’Donoghue free. The visitors managed another five points from play thereafter while a underwhelming Kerry could only muster four scores from frees. The first half, played in blinding sunshine and heavy downpours, was a dull affair, punctuated only by David Moran’s brilliant goal in the 15th minute and McCarron’s 12 minutes later. Paul Murphy did rattle an early shot off a Monaghan post, but converted frees from McCarron and goalkeeper Rory Beggan edged Monaghan into an early lead. A fine Kerry counter-attack ended with Moran crashing the ball past Beggan to give Kerry the lead and Tadhg Morley and James O’Donoghue (free) extended Kerry’s lead to 1-2 to 0-2 by the 24th minute. Paul Geaney fluffed a great chance for a second Kerry goal when he blasted wide with just Beggan to beat, but Murphy and O’Donoghue (free) raised white flags to edge Kerry five clear. Monaghan persisted with their patient, probing game and in the 27th minute they found the opening when McCarron finished the ball to the net after Brendan Kealy had saved smartly from Conor McManus’s low drive. Kieran Hughes and Geaney (free) exchanged points to see Kerry lead 1-5 to 1-3 at the interval, but playing into a strong wind Monaghan would have been the happier side at the break. O’Donoghue’s free put Kerry three clear, but Doogan’s goal cancelled out that lead and from there to the end it was a cagey affair. Kerry huffed and puffed, but struggled to find the openings and scores, while McCarron and McManus scored a brace each, and Kieran Hughes added a fifth to see Monaghan over the winning line. Kerry’s bad day at the office was compounded by the sending off of Bryan Sheehan who was issued a red card mere seconds after coming on as a 65th minute substitute when in his very first involvement he was dismissed. Scorers for Monaghan: Jack McCarron 1-3 (1f), Gavin Doogan 1-0, Conor McManus 0-2, Kieran Hughes 0-2, Rory Beggan 0-1 (f). Scorers for Kerry: James O’Donoghue 0-3 (3fs), Paul Geaney 0-3 (3fs), David Moran 1-0, Tadhg Morley 0-1, Paul Murphy 0-1, Barry John Keane 0-1 (f), Brendan Kealy 0-1 (f). MONAGHAN: Rory Beggan, Fintan Kelly, Drew Wylie, Ryan Wylie, Kieran Duffy, James Mealiff, Colin Walshe, Darren Hughes, Kieran Hughes, Karl O’Connell, Shane Carey, Gavin Doogan, Conor McCarthy, Jack McCarron, Conor McManus. Subs: Neil McAdam for C Walshe (30 mins), Owen Duffy for D Hughes (HT), Ryan McAnespie for J Mealiff (HT), Conor McCarthy for O Duffy (45 mins), Thomas Kerr for D Malone (65 mins). KERRY: Brendan Kealy, Shane Enright, Mark Griffin, Killian Young, Tadhg Morley, Peter Crowley, Ronan Shanahan, David Moran, Jack Barry, Jonathan Lyne, Paul Murphy, Kevin McCarthy, Jack Savage, Paul Geaney, James O’Donoghue. Subs: Stephen O’Brien for J Savage (HT), Stephen O’Brien, Barry John Keane for P Geaney (50 mins), Adrian Spillane for K McCarthy (52 mins), Anthony Maher for J Barry (b/c, 55 mins), Darran O’Sullivan for P Crowley (61 mins), Bryan Sheehan for D Moran (65 mins). Tipperary defeated Laois by 1-16 to 1-10 in Round 3 of the Allianz Football League Division 3 on Saturday February 25th at O’Moore Park Portlaoise. Tipperary manager Liam Kearns was the man smiling at the final whistle after both he and Peter Creedon had a reunion with former charges in the Allianz Football League Division 3 clash at at O’Moore Park. Despite dominating possession, Laois found themselves three points down after 10 minutes, having shot five wides. Donie Kingston opened the scoring for the hosts from a free but Conor Sweeney replied in kind before Jimmy Feehan lofted a score from outside the 45 to give the visitors the lead. Tipp might have had a lesser share of the ball but they were looking much more threatening with it. Sweeney brought his tally to four and the visitors had at least four half-chances of goals in this period as their support play and strong, direct running left the Laois defence in sixes and sevens. Colm Begley ended his side’s 16-minute drought with a lovely score off the outside of his left boot to spark a revival. Niall Donoher and Kingston added some excellent scores themselves and having trailed by five, the hosts were back to within one at half time, 0-7 to 0-6. Tipperary had lost All-Star Michael Quinlivan by this juncture, having received treatment three times in the opening period from the time he received a late shoulder that sent him crashing to the ground seconds into the game. He went down later on holding his head after taking a free and was finally replaced by Liam McGrath in the 25th minute with what appeared to be concussive symptoms. On his first appearance of the season, John O’Loughlin levelled within seconds of the resumption but Tipp got their noses in front once more, Austin and McGrath supplementing the successful free-taking of Sweeney. Evan Comerford made two magnificent saves from Donie and Paul Kingston before the former, who had been Laois’s best player, was incorrectly black-carded by Niall McKenna, who made a number of questionable decisions. The home support found their voices when David Conway took a brilliant pass from Darren Strong to goal in 60th minute. That left just one between them but Tipp found the right response once more, with points from Liam Casey, Emmet Moloney and Kevin Fahey giving them breathing space before Kevin O’Halloran’s fortuitous injury-time goal set the seal on a fine performance. Tipperary: E Comerford, A Campbell, P Codd, W Connors, E Moloney 0-1, R Kiely, J Feehan 0-1, J Kennedy, L Casey 0-1, J Keane 0-1(f), K O’Halloran 1-0(f), B Fox 0-1, C Sweeney 0-7(5fs), M Quinlivan, P Austin 0-2. Laois: G Brody, D Strong, D Booth, J Kelly, S Attride, C Begley 0-1, E Buggie, J O’Loughlin 0-1, S Ramsbottom, D O’Reilly, D Conway 1-2(0-1f), N Donoher 0-1, D Luttrell, D Kingston 0-5(3fs), P Kingston. The Tipperary football team to play Laois in Round 3 of the Allianz Football League Division 3 encounter in O’Moore Park, Portlaoise tomorrow Saturday, February 25th, at 7pm has been announced by manager Liam Kearns. It’s as you were once again for Kearns’ side as Tipp look to bounce back from the one point defeat to Sligo in the last round. This entry was posted on Saturday, February 25th, 2017 at 12:00 am and is filed under events, News. You can follow any responses to this entry through the RSS 2.0 feed. Both comments and pings are currently closed. Carlow defeated Limerick by 1-10 to 0-10 in Round 3 of the Allianz Football League Division 4 on Saturday February 25th at Netwatch Cullen Park, Carlow. A third defeat out of three ended Limerick’s hopes of a quick return to Division Three of the National Football League as it ended Carlow 1-10, Limerick 0-10 in Dr Cullen Park. Out of contention with over half of their programme still to play, their goose was cooked by Carlow’s burst of 1-3 without reply during the opening minutes of the second half. Up to that point, everything had been going right for the visitors. Séamus O’Carroll broke the stalemate to put Limerick ahead only to be met immediately by John Murphy pointing on the run but the visitors’ more adventurous approach saw Jamie Lee’s long free and Iain Corbett put them ahead. Seán Murphy and John Murphy drew Carlow level but then Lee’s free and two delightful strikes from Danny Neville opened up some blue water. However, a break from the back delivered a Darragh Foley point and, after O’Carroll sent over a ‘45’, Brendan Murphy pulled one back for the hosts to leave them trailing 0-7 to 0-5 at the break. Just three minutes after the restart, the home supporters were in full voice as Brendan Murphy’s speculative shot was punched out by Donal O’Sullivan and Ciarán Murphy was pulled down after collecting the clearance. John Murphy slotted home the penalty and, with their tails up, Shane Clarke, Eoghan Ruth and Brendan Murphy put four between the sides. Ger Collins interrupted the gallop, giving Limerick the break to claw their way back into contention and, with Carlow’s workrate eased off. A Collins free shaved the gap further but they missed chances to bring it back to a point and Murphy punished them by striking from distance. Carlow settled back into the possession game for the last ten minutes of normal time and five added for stoppages and had the strength where it counted to keep Limerick at bay. SCORES: Carlow: John Murphy 1-1 (1-0penalty), Brendan Murphy 0-4, Darragh Foley (0-2) (1free), Seán Murphy, Seán Gannon, Eoghan Ruth 0-1 each. Limerick: Ger Collins 0-3 (2frees), Séamus O’Carroll (1 ‘45’), Jamie Lee (2 frees), Danny Neville 0-2 each, Iain Corbett 0-1. Subs: Peter Nash for Danny Neville (49mins), James Naughton for Jamie Lee (49mins), Pádraig Quinn for Iain Corbett (57mins), Pádraig Scalon for Brian Donovan (64min), Seán McSweeney for Séamus O’Carroll (69mins), David Ward for Cian Sheehan (71mins), Pádraig Scanlon (black card, 74mins, not replaced). SUBS: Seán Gannon for Danny St Ledger, inj (i28 mins), Mark Rennick for Danny Moran (54mins), Jamie Kenny for Shane Clarke (62mins), Shane O’Neill for Ciarán Moran (74mins). 16. Brian Scanlon (Gerald Griffin’s), 17. Daniel Daly (Fr Caseys), 18. Padraig Quinn (Monaleen), 19. Tony McCarthy (Kildimo/Pallaskenry), 20. James Bridgeman (St. Senans), 21. David Ward (Fr Caseys), 22. Sean McSweeney (St Kierans), 23. Peter Nash (Kildimo/Pallaskernry), 24. James Naughton (St. Senans), 25. Padraig Scanlon (Glin), 26. Barry Lynch (Castlemahon). St. Brendan’s Killarney defeated Tralee CBS by 2-20 to 0-11 in the Corn Ui Mhuiri Football Final on Saturday February 25th at Austin Stack Park Tralee. Corn Ui Mhuiri final – St Brendan’s Killarney 2-20 Tralee CBS 0-11: From west to east, the wellspring of Kerry football talent is shifting. Who knows why these things happen. Neat answers abound. Dr Crokes continue to produce stellar youngsters on an industrial scale, but they’ve been an oasis in East Kerry, which hasn’t won a senior county championship since 1999. Seamus Moynihan coached the division to the county minor title last year, and the Glenflesk legend’s stock as a mentor rises daily and stealthily. Vince Cooper – you may know his brother – is doing lauded work as the GDA in the region. Each is a contributory influence, doubtless, but seven clubs were represented on the St Brendan’s team that went through the gears seamlessly in Tralee on Saturday to retain the Corn Ui Mhuiri crown with 15 points to spare. This isn’t a single-engined vehicle. Tralee CBS had been rigorously gut-checked over three intense games against Coláiste Chríost Rí in the semi-final but once David Shaw goaled six minutes after the break for the Sem, their opponents knew they were in the wrong weight division. Sem manager Gary McGrath is well aware the All-Ireland colleges (Hogan Cup) champions are a talented group but he hasn’t been slow to call in reinforcements in the guise of some of last year’s stellar Leaving Certs to bulk up A v B duels with the class of 2017. The Green stood their ground in an engaging first- half on Saturday, employing a sweeper and utilising the height and mobility of full- forward Gearóid Fitzgerald to keep the Sem honest. Tralee were only a point down after 15 minutes and trailed 0-8 to 0-6 at the break. In truth, though, the Killarney lads were just getting started. Three fast scores on the resumption and Shaw’s goal stretched the gap to six (1-11 to 0-8). But the time midfielder Billy Courtney powered through for the second goal on 44 minutes, the Sem were 2-14 to 0-9 in front. Done and dusted. There’s eight of the Sem squad with the Kerry minors aiming for a fourth All-Ireland in a row this year (interestingly, Tralee CBS has no player in the currrent minor squad), and if the Killarney school regains the Hogan Cup, that will be four successive Kingdom successes in the schools grade too. And it’s all down to the development squads? Three Croke Park county minors from last year – Billy Courtney, Dara Moynihan and David Shaw – contributed 2-6 between them, but Firies centre-forward Donnchadh O’Sullivan is a two-footed talent to keep an eye on over the summer. He claimed seven points on Saturday and his movement caused Tralee a lot of difficulties. All in all though, St Brendan’s look exactly what no school team should so early – seasoned. If over-confidence doesn’t up-end them, it will take some haymaker from an opponent to do so. It was a first final in nine years for Tralee and the likes of Kieran Dwyer, Brandon Patterson, the O’Connors at midfield and tidy scorer, Michael Kelliher will be enhanced by the campaign. Scorers for St Brendan’s: D Shaw (1-4), D O’Sullivan (0-7, 4 frees), B Courtney (1-1), J Griffin, M O’Shea (0-2 each), N Donohue, C Gammell, D Moynihan, B Keane (0-1 each). Scorers for Tralee CBS: M Kelliher (0-4, 3 frees), T. O’Connor (0-2), K Dwyer (free), T Hoare, D Keane, S Quilter, N O’Mahoney (0-1 each). St BRENDAN’S: R Osborne (Legion); L MacMonagle (Dr Crokes), C. O’Donoghue (Glenflesk), S O’Leary (Kilcummin); J Griffin (Dr Crokes), M Potts (Dr Crokes), N Donohue (Firies); B Courtney (Dr Crokes), C Gammell (Legion); D Moynihan (Spa), D. O’Sullivan (Firies), B. Keane (Listry); D Shaw (Dr Crokes), M O’Shea (Dr Crokes), C Flynn (Firies). Subs: M Hartnett (Dr Crokes) for Keane (44);; M Fitzgerald (Dr Crokes) for Griffin (56). Subs: S Quilter (Austin Stacks) for Donnellan (41); A Roche (Kerins O’Rahillys) for Scanlon (49); D Fitzmaurice (Austin Stacks) for Kelliher (54); S Hamilton (Churchill) for Hoare (58). In the event of a draw, the replay will be scheduled for the 4th March. Don’t forget to pick up a copy of the 36 page souvenir match programme. 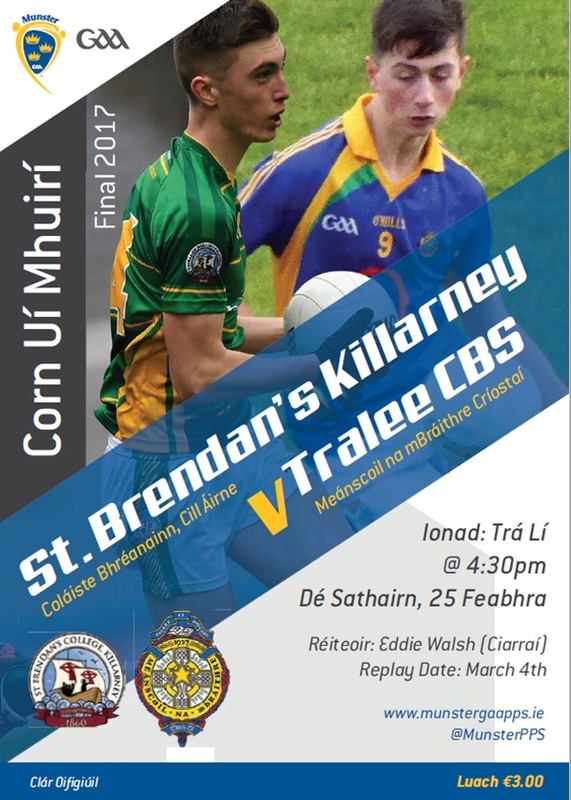 Saturday’s Corn Ui Mhuiri Final will serve as yet another reminder of the healthy state of Kerry underage football as St Brendan’s Killarney look to retain their title against a battle hardened Tralee CBS side. St Brendan’s Killarney as reigning Corn Ui Mhuiri and Hogan Cup champions have been impressive in their march to this year’s Munster Final. In their five matches to date, they have averaged just under 25 points on aggregate per game. Perhaps an even more impressive stat in their mean defence which has kept opponents to under ten scores in all bar their semi-final when St. Flannans managed to score 1-11. With a sprinkling of All-Ireland Minor Football medal winners in their team, St. Brendan’s will certainly go in to Saturday’s game as deserving favourites. Tralee CBS on the other hand were not seen as one of the favourites to progress to this stage, in particular when losing out by three points to St. Francis College Rochestown in the group stages. Tralee managed to qualify for the knockout stages as group runners-up and in the Quarter-Final, they were put to the pin of their collar by IS Killorglin before winning out by 3 points. A semi-final versus Colaiste Chriost Rí awaited and what an epic saga that turned out to be as it took 220 minutes of football to separate the sides. In the first game, Colaiste Chriost Rí were the better side early on but Tralee CBS looked destined to progress only for the Cork side to come back to level at the end of normal time and the end of extra time to force a replay. In that replay, it was Colaiste Chriost Rí who found themselves in front only to be pegged back with late Tralee CBS scores at the end of normal time and extra time to ensure a third game was required. In that second replay, Tralee CBS scored an all-important goal early on and that proved decisive in earning a 1-10 to 0-11 victory and with it, a place in the Corn Ui Mhuiri Final. If you cannot make it to the Austin Stack Park Tralee on Saturday will be streamed live via www.munstergaapps.ie. Don’t miss out. Eddie Walsh of Kerry will be the referee for Saturday’s Final and may the best team win. This entry was posted on Saturday, February 25th, 2017 at 12:00 am and is filed under events, News, Videos. You can follow any responses to this entry through the RSS 2.0 feed. Both comments and pings are currently closed. Mary I defeated IT Carlow by 3-24 to 1-19 in the Independent.ie Fitzgibbon Cup Final on Saturday February 25th at Pearse Stadium Galway. Mary Immaculate College from Limerick retained the Fitzgibbon Cup in style at Salthill with the reigning champions never trailing in an entertaining final. DJ Carey’s IT Carlow had hoped to become the 10th college to win the crown, but the day belonged to Mary I and their manager Jamie Wall. The former Cork dual player was on the Mary I team which lost in its first Fitzgibbon Cup final appearance in 2013 at this venue but he has been confined to a wheelchair for the past few years due to an illness. Mary I used the strong wind in the opening half and deservedly led by double scores at 0-16 to 0-8 at the end of a free-flowing opening half. The champions wasted little time in getting on top and points from Michael O’Neill, Aaron Gillane, and Conor Twomey in the opening four minutes gave them a strong foothold. However IT Carlow, appearing in their first final, did not panic and Stephen Maher got them off the mark after five minutes with the first of five pointed frees which he hit in the opening half. Limerick’s Darragh O’Donovan hit two points from sidelines for Mary I, while Tipperary’s Ronan Maher was superb as he struck four with the wind, three of them frees from long range. Those scores saw the holders continue to push further ahead and they led by 0-9 to 0-3 at the end of the opening quarter. IT Carlow, though, kept hanging in there with Waterford’s Colin Dunford and Charles Dwyer scoring good points. Mary I finished the opening half strongly with former All-Star Colm Galvin hitting a point and Limerick’s Cian Lynch bringing his haul to 0-3 to lead by eight at the break. Two more frees by Maher cut the gap in the opening four minutes of the second-half, but O’Neill hit back with his third point for Mary I. And then a delivery from Luke Meade broke for O’Donovan to dispatch the ball to the net with a one-handed strike and make it 1-17 to 0-10 after 36 minutes with Conor Twomey extending the lead with a point from distance. But IT Carlow never gave up and points from Martin Kavanagh and Maher gave them hope as they reduced the margin to 1-20 to 0-14 going into the final quarter. Then Mary I struck another huge blow when Gillane blasted home a penalty after he was fouled by Kevin Hannfinn with 12 minutes left. Maher got a goal for Carlow six minutes from time but the gap was too big to bridge for the newcomers. Mary I sealed the win when sub Pa Ryan finished to the net after Gillane’s shot was saved by Enda Rowland. Scorers for Mary I: A Gillane 1-5 (1-0 pen, 4fs), D O’Donovan 1-3 (0-2 sl), R Maher 0-4 (3fs), P Ryan 1-0, M O’Neill 0-3, C Lynch 0-3, C Twomey 0-3, C Galvin 0-1, L Meade 0-1, S Cahill 0-1. Scorers for IT Carlow: S Maher 1-13 (12fs), C Dunford 0-2, C Dwyer 0-2, M Kavanagh 0-1, C Bolger 0-1. Substitutes: Thomas Monaghan for Gallagher (half-time), Pa Ryan for O’Neill (55), Sean Burke for Gillane (63). Substitute: Tommy Nolan for Russell (50). This entry was posted on Friday, February 24th, 2017 at 12:00 am and is filed under events, News. You can follow any responses to this entry through the RSS 2.0 feed. Both comments and pings are currently closed. IT Carlow defeated UCC by 2-20 to 1-20 in the Independent.ie Fitzgibbon Cup Semi-Final on Friday February 24th at Dangan, Galway.